Newly planted saplings, those in nurseries, young trees under stress, and large ornamentals are all susceptible to attack. The result of canker development is the death of branches, an unattractive appearance, and possibly whole-tree mortality. Stem cankers may cause stem breakage under snow loads or high winds. Points of branch breakage and cankers present ideal locations for infection by decay and other fungi. This fungus was known for many years as Dothichiza populea Sacc. & Briard. There is evidence that this disease is European in origin. 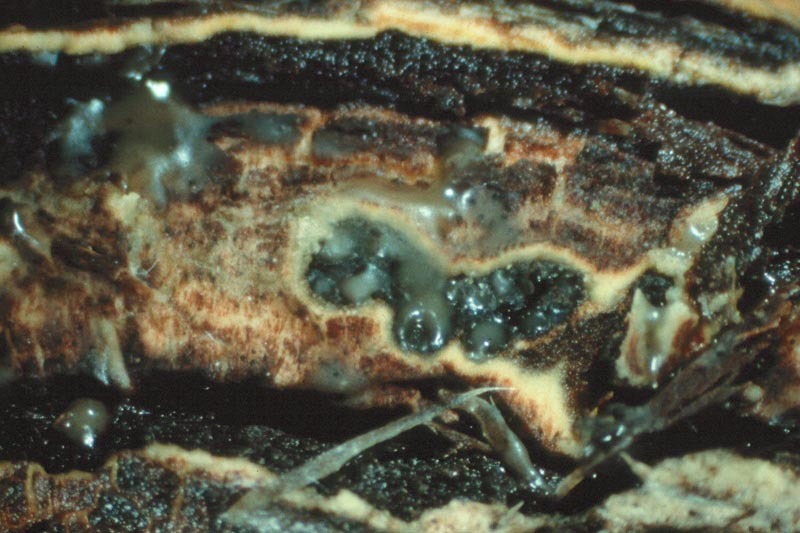 Trees under stress are most often infected by this fungus. Control is best carried out through silvicultural methods. When establishing stands, trees should be widely spaced to reduce tree-to-tree infection, and diseased portions should be pruned from infected trees. Pruning should be carried out only during the main growing season and not at cooler times of the year. Planted stock should be maintained under good growing conditions to reduce stress and subsequent infection at outplanting. Myren, D.T., Laflamme, G., Singh, P. et Lachance, D. 1994. Maladies des arbres de l’est du Canada. Ressources naturelles Canada, Service canadien des forêts, Direction des sciences et du développement durable, Ottawa, 159 pp. Fruiting on a Dothichiza canker caused by Cryptodiaporthe populea. 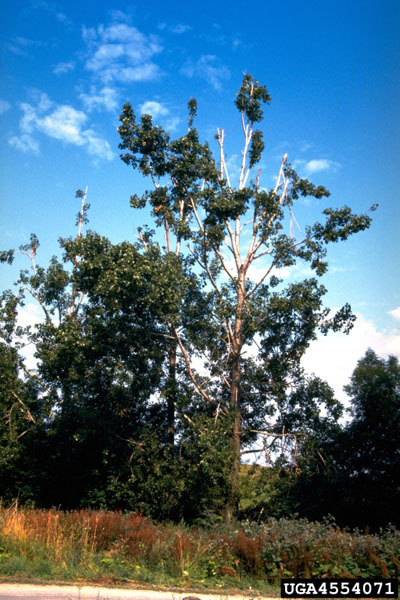 Damages caused by the dothichiza canker of poplar. 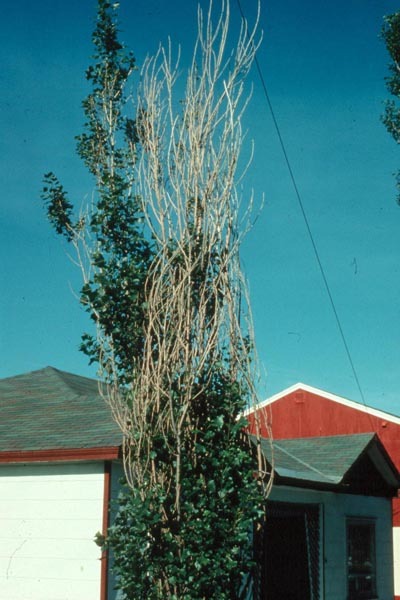 Dieback of a a Lombardy poplar (Populus nigra cv. 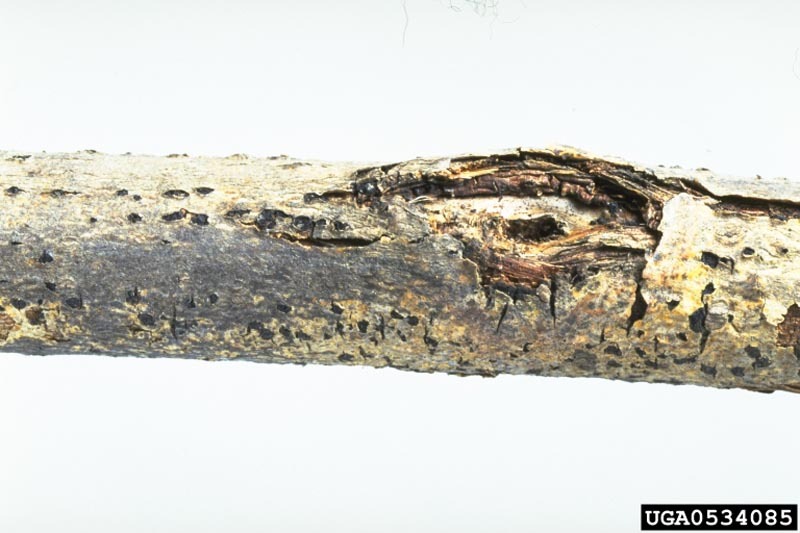 Italica) due to infection by Cryptodiaporthe populea, the causal agent of Dothichiza canker.